Where to Buy Contrac Soft Bait, Contrac Soft Bait Rodenticide - 16 Lbs - $103.48 for Sale with Fast Free Shipping! Contrac Soft Bait Rodenticide - 16 Lbs, a single-feed formulation, contains the second generation anticoagulant, bromadiolone. 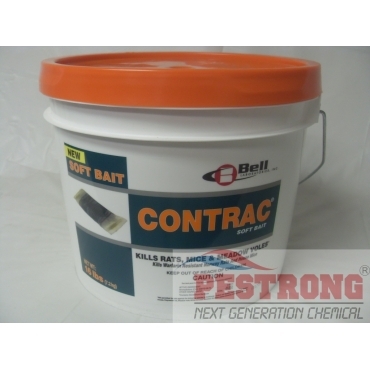 Contrac All Weather Blox Rodenticide - 18.. It is our most extensively researched and tested rodenticide which has undergone comprehensive field testing to ensure its performance in urban, rural, commercial and residential settings. Contrac Soft Bait was specially formulated with an optimal blend of saturated and unsaturated fats. This unique, oil-based formulation coupled with a manufacturing process which ensures maximum contact of the sachet to the soft bait, results in increased bait acceptance. Norway rats, roof rats, and house mice may consume a lethal dose in one night's feeding with first dead rodents appearing four or five days after feeding begins. I have used many different types of rodent bait to various degrees of success. These soft baits have worked best for me and this will be my choice of rodent baits from now on. Just one packet is very effective at killing rodents. I have had guaranteed results every time I have used this. Contrac has always been my brand of choice for rodent poison bait. I really like this one the best though, the soft bait doesn't leave "crumbs" like the blocks do and the pellet pacs always leave a couple of the pellets lying around somewhere. These soft bait ones do not, or at least it doesn't seem to. I can't say for sure, but from my eyes, I see little to no bait lying around somewhere.